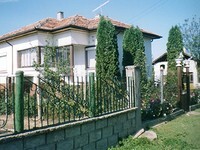 The cheap Bulgarian property market attracts many investors from all over the world. The real estate market in Bulgaria in the current 2017 has been really dynamic. 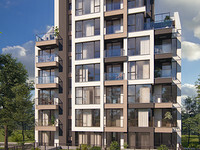 Properties in Bulgarian capital Sofia have attracted lots of attention which pushed the building of many new apartment developments in the city. The interest in coastal properties along the Black Sea continues and the search for rural houses in the beautiful Bulgarian country side grows. Bulgaria offers great climate, both sea and ski tourism and that is why an increasing number of British, US, Greek, Belgian and Italian citizens are attracted by the wide variety of properties available in Bulgaria. 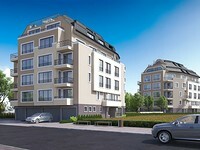 People buy properties in Bulgaria both for personal use and investment purposes. At Best Bulgarian Properties you can buy a cheap house in Bulgaria, apartment by the sea, a ski resort property or development and agricultural land in Bulgaria at the cheapest price on the market. Browse through the rich selection of Bulgarian properties for sale on this site and discover how easy it is to join many others in owning a property in Bulgaria. 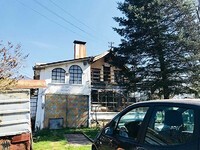 A luxury property for sale located just 15 minutes’ drive from center of Bulgarian capital Sofia in a village called Prolesha. The area is ecologically clean, without industrial pollution. It is green and picturesque and surrounded by nature. The village itself has population of around 700 people . There are a few shops, cafes and a restaurant. There is regular public transport connecting the village with Sofia. The estate we offer for sale is spread on large piece of land 2400 sq.m, all fenced with high dense fence which provides complete privacy of the whole area. The estate includes several buildings. An official gate door leads to the main house which comprises 480 sq.m of living area distributed between ground floor , 6 bedrooms and couple of sitting areas , living room and a kitchen . The house has a very large terrace nicely made with wooden floor and side glass walls providing shelter from cooler spring and autumn evenings and making it a pleasant sitting place almost every season. The kitchen of the house is supplied with Miele electrical appliances as follows – oven, steam oven, microwave , hot pots plot , fridge and freezer. The six bedrooms that the main house has are situated at different levels of the house. The building itself has a very floating disposition which adds to the feeling for privacy . The master bedroom is on the top level with its own bathroom and toilet and a lot of space . The room also has a safe premise that can be used according to the needs of the new owner. On the ground level there is an inside swimming pool, good sized sauna and massage room, as well as servicing premises for boilers , filters and pipes needed for the house. All the finishing works in the house are in excellent condition with high quality materials. About 20 meters away from the main house there is a newly built building with a large hall, high ceiling, fully equipped kitchen, fire place and excellent ventilation system. The building also has a bedroom and bathroom with toilet and Jacuzzi fitted in the bathroom. There is also an outside sitting area with barbeque space. All finishing works are to the highest standards and the furniture is stylish and in excellent condition. This building can be ideally used as a large one bedroom apartment or as a guest house and of course as perfect party hall. 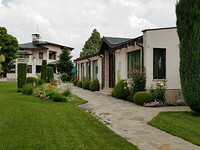 Continuing down through the excellently landscaped garden almost at the bottom of the estate there is a third building with two floors, each of them providing 70 sq.m of living area or a living room with two bedrooms. This house is currently used by a family – husband and wife who are helping the owners to maintain the estate. They take care for the garden , for the trees all systems that the house is equipped with and all general maintenance the property needs. 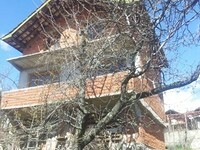 This is a very old house for sale, located in the ancient part of the town Sozopol. Sozopol is the oldest town on the Bulgarian Black Sea shores. The first settlement here dates back to the Bronze Age. Today, Sozopol is one of the popular sea-resort destinations in the country. It is attractive both with the cultural heritage and its golden sand beaches. The house is built in the Renaissance architecture of the Old Town. The architecture of this part of the town is well preserved creating a romantic atmosphere for its visitors. In 1961 an archeological museum was founded in which the history of this ancient town is told by remarkable artifacts displayed in its hallways - collections of rock anchors, ceramics, amphora, coins and other products of ancient art. The house has face to two central streets in the resort. It also includes permission for construction. It is old, but very well maintained and has been inhabited constantly. 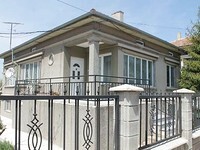 It is two stories and with total living area of 160 sq m. The property includes also a small yard - over 20 sq m in size. 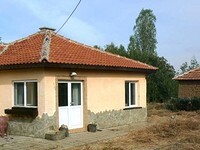 This is an offer for a wonderful newly built house for sale, located near the famous balneological resort - Sandanski. 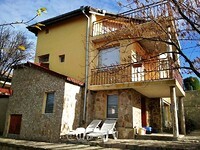 The property is located just 5 km away from the town of Sandanski. Sandanski, a beautiful and lively spa town in South West Bulgaria, is favored for its warm and sunny climate, picturesque mountain scenery and therapeutic spa waters. Sandanski is located in south-western Bulgaria along the banks of the Bistritsa River, 65 km away from Blagoevgrad. The property consists of a beautiful newly built house and a nice landscaped yard. The house is one story with a basement, comprising total living area of 100 sq m. The living area is distributed between two bedrooms with two bathrooms, living room with dining area and kitchen. The house is finished to meet the highest requirements of construction. The window joineries are PVC, the floorings are laminate in the bedrooms and living room, terracotta in the dining area and kitchen. The bathrooms are finished with terracotta and faience. The house has central heating and all radiators installed. 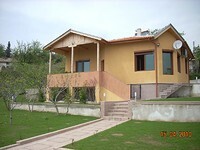 It is for sale fully furnished and equipped with everything necessary. There is even a Jacuzzi in one of the bathrooms and a fireplace in the living room. The house is built on a yard - 650 sq m large. The plot is nicely arranged with beautiful landscaped lawn and granite paths across it. There are also some fruit trees and other greenery. This is a single-storied house, fully renovated from inside and outside, located in southern Bulgaria, Haskovo district. The house consists of two bedrooms, kitchen, WC, large entrance hall (lounge) with a window and stretch-sofa. It is furnished with modern furniture and equipment. All of the electrical appliances are included in the price. There is a possibility for internet and satellite TV. The total living area is 98 sq m. The size of the yard is 1700 sq m. In the garden, there are two additional buildings - a summer kitchen and a barn. 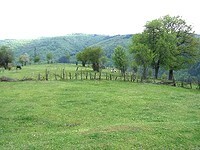 The village is part of municipality of Harmanli, Haskovo district. It is at the distance of 29 km from Harmanli, 20 km from Lyubimets, 30 km from the Greek border and 50 km from Turkey. All roads are asphalted and good quality. The area has beautiful natural places and interesting historical and archaeological sites. This is a house with superb sea panorama, located near a pine forest and 200 m from a bus stop in Gorna Traka area only 5 km from the center of Varna! The house offers a total living area of 322 sq m. The distribution of the premises inside is the following: First floor - corridor, living room, guest room, basement, bathroom and toilet, staircase to the second floor. Second floor - two bedrooms (one with balcony), bathroom with toilet, staircase to third floor. 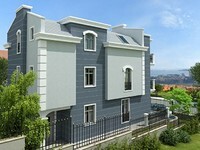 Third floor - three bedrooms (one with a large balcony of 16 sq m), a bathroom and a toilet. There is also a garage with size 40 sq m and inside connection to the second floor. The house has a central heating system (each room is equipped with a radiator). In the yard, there is a small chapel (6 sq m), a barbecue (20 sq m), vines, decorative well, landscaped and maintained garden, etc. There is electricity, water, hydrophore system, two parking spaces, SOT and video surveillance systems. 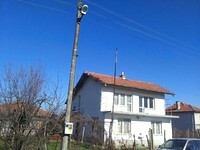 Offering for sale are two brick houses, additional agricultural buildings and two garages sharing one plot of land with area 800 sq m. The property is located in a developed village part of Etropole municipality, Sofia district. The village lies about 85 km west from Sofia (via Hemus motorway), which is about an hour drive away. The town of Etropole is at 12 km distance. The property is flat, with year round access by an asphalt road. It is bordered by a river. This is a very picturesque, beautiful and peaceful place. The property is facing a main road with a bus stop. The street is newly asphalted, with year-round access. The houses are in good condition and only need cosmetic repair. There is an opportunity to purchase a neighboring plot of 740 sq m at a price of 3500 euro. 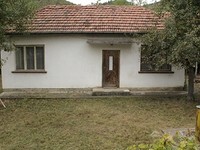 The house is located in a picturesque village, 13 km from the town of Yambol. It is relatively new, being built in year 1998. The house has two floors. The first floor consists of a kitchen, living room, bedroom, bathroom with toilet and another toilet. This floor is equipped with a TV set, audio set, refrigerator, stove, microwave, washing machine, fireplace – all included in the price. This floor is 70 sq m in size. The second floor consists of 2 rooms and a large bathroom, two terraces. The house is supplied with water, sewerage and electricity. In the yard there is another old house, which is used for storing tools. There is a garage and farm buildings. The total area of the yard is ​​3000 sq m. Part of it is planted with vineyards and fruit trees. There is a septic tank for the irrigation water.